EcoBalanza makes beautiful custom upholstered headboards and bedframes for your home. In the cold, dark days of December in Seattle, we dream about curling up on a sumptuous sectional in front of a roaring fire with our loved ones. While we are known for creating the world's most luxurious organic sofas, sectionals make up a big part of our portfolio every month. Typically, no two sectionals are the same. That's because we work with each person to create the sectional of their dreams using only organic, non-toxic materials. 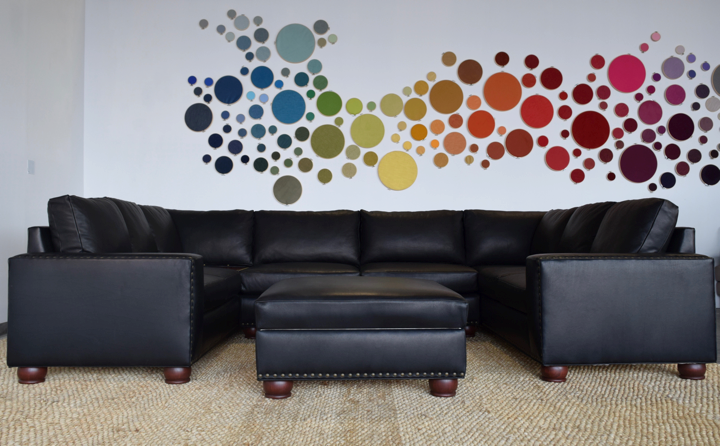 There are a number of ways you can work with us to create a sectional for your space. You can select from a range of non-toxic fabrics and leathers to bring your piece to life. Contact us today to start the design process. We'd love to see an EcoBalanza sectional in your space in the new year. It’s been a busy summer at EcoBalanza and we have been hard at work creating the world’s most luxurious non-toxic upholstered furniture one sofa, chair, loveseat, sectional, ottoman and headboard at a time! We loved meeting Puget Sound Business Journal staff writer Nuoya Zhou and photographer Anthony Bolante when they visited the studio to interview our founder and CEO, Aimee Robinson for their Women who Lead series. Anthony’s photographs capture Aimee’s passion and humility and showcase the materials and techniques that go into each piece we create. And, Aimee’s dog, Peanut was excited to make her photographic debut in the Journal too. We were so honored that Nuoya reached out to James Connelly, International Living Future Institute’s Vice President of Products and Strategic Growth. ILFI is a global network dedicated to creating a healthy future for all. ILFI created an international sustainable building certification program called the Living Building Challenge in 2006, which requires all materials used to be free of toxins. Speaking of the Living Future Institute, we were proud to be included in an article they wrote for their TrimTab blog listing ten companies who are creating interior products made with innovative materials that are pushing the limit on healthy products. Other products featured include Metroflor Corporation’s Aspecta Luxury Vinyl Tile, Mohawk Group’s Lichen Collection, a modular carpet tile product backed by the company’s EcoFlex NXT backing and Armstrong Ceilings’ SUSTAIN™ portfolio of ceiling systems. EcoCult loves anything local, sustainable, eco-friendly, handmade—when it’s done well. That’s why it was no surprise when the site published their ultimate guide the eco-friendly and ethical furniture. What was a surprise and a delight was that they included EcoBalanza in their round-up of sustainable new furniture. It was extremely gratifying that EcoCult listed EcoBalanza first as the company most committed to sustainable materials and production methods. The article provides a host of invaluable information whether you are shopping for sustainable and ethical living room, dining room or bedroom furniture.